Little Common’s footballers produced a stunning comeback to claim an unlikely point yesterday (Saturday). 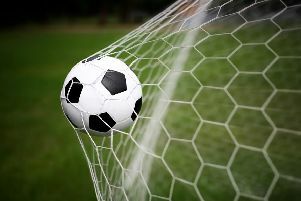 The Commoners scored four goals in the final 20 minutes to salvage a 4-4 draw away to Midhurst & Easebourne in Macron Store Sussex County Football League Division Two. Playing their first match of 2015, Common player-manager Russell Eldridge was able to name an almost full strength squad with just Sam Brown and Steve Mote missing through injury. Common once again started in sluggish fashion and gifted their hosts an opener within two minutes when Miles Hamilton was given time and space to race through and smash an effort beyond Matt Cruttwell. Common came into the match and enjoyed a period of sustained pressure. Eldridge saw an effort blocked and a Zack McEniry header failed to trouble the goalkeeper. The visitors’ pressure counted for nothing, though, when a quick break led to Midhurst doubling their lead in the 12th minute when Hamilton rose unchallenged to head home from six yards. Common were now looking like a team who had not played for almost a month and failed to find any rhythm as the half wore on. It was no surprise when Hamilton sealed his hat-trick in the 32nd minute as Common were once again caught napping in defence. It looked like it was going to be a long afternoon for the visitors. Cruttwell was on hand to deny the hosts a fourth as they threatened to run riot and the Commoners were only too pleased to hear the half time whistle. The second half began with Common looking more positive and Steve Morris twice found himself in good positions only to be denied by dubious decisions from the referee’s assistant. Any hope that Common had of getting themselves back into the match seemed to disappear in the 65th minute when Hamilton lifted the ball over Cruttwell for his and Midhurst’s fourth goal of the afternoon. The introduction of Jared Lusted seemed to pay instant dividends for Common when his delivery into the box was met by Morris and the home goalkeeper could only able to palm the ball into the path of Alex Carey, who made no mistake from three yards. Lewis Hole soon stroked the ball home from close range following a pass from Carey to make it 4-2. The Commoners could now sense a comeback and with 10 minutes remaining, Hole grabbed his second after finding himself unmarked in the Midhurst box. The home defence repelled wave after wave of Common pressure, but as the match drifted towards injury time, a long delivery into the Midhurst area saw Morris wrestled to the ground and the referee point to the penalty spot. Eldridge stepped up to convert the penalty and complete a remarkable fightback. Common almost snatched a late winner when Hole saw an effort cleared off the line by a player who was then shown a second yellow card for re-entering the field of play without the referee’s permission. In the dying seconds an Eldridge free kick was clawed away and from the resultant corner, Lusted saw an effort fizz just over the crossbar. Common: Cruttwell, R. Mote, Sherwood, Eldridge, McEniry, J. Smith, Denny (Lusted), Bristow (Feakins), Hole, Morris, Carey. Subs not used: A. Smith, Wells.